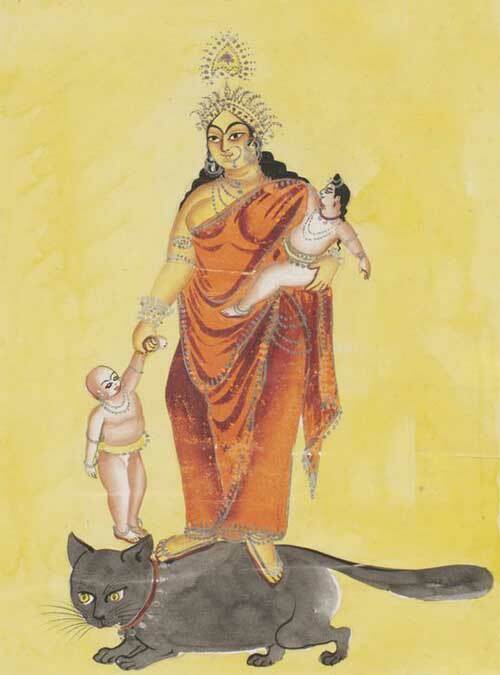 Goddess Shashti Devi is worshipped for the welfare of children. She nurses and protects children. She takes care of infants. Goddess Sashti is worshipped on the sixth day after the birth of a child to safeguard it from diseases and to ward off evil. She is again offered prayers on the 21st day after childbirth and again when first food is given to the baby. Those couple having trouble in getting a progeny will be blessed with a healthy child if they worship Shasti Devi for a year (Devi Bhagavata). Goddess Shashthi Devi is invoked in a Salagrama stone or in the root of banyan tree. In some regions, she is painted on the wall of the house or a sacred place. Who is Goddess Shashthi Devi? She is the daughter of Brahma and wife of Skanda or Muruga (son of Shiva and Parvati). She is known as Sashti because she is taken to be one-sixth of prakriti or nature. Mahabharata and Devi Bhagavata equates her with Devasena, wife of Skanda or Muruga. But Sushruta Samhita and Kashyapa Samhita, Ayurvedic Texts, identify her with Revati and describes her as sister of Skanda. Shashthi Devi has six faces, she is beautiful, she blesses devotees with boons, and is she is capable of assuming desired forms. Information about the deity is found in Brahmavaivarata Purana, Devi Bhagavata, Mahabharata and Narada Purana. She is worshipped in some regions on the sixth day of the waxing phase of moon in Chaitra Month (March – April). In some regions, she is worshipped only on the sixth day of the Shukla Paksha (waxing phase of moon) of Jyeshta month. The Goddess is widely worshipped in Eastern parts of India. She is also worshipped by Telugu speaking people of Telangana and Andhra Pradesh. Her worship is also prevalent among certain communities in North India.